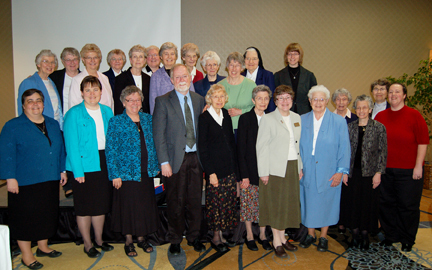 The Benedictine Sisters of Annunciation Monastery hosted the Third Annual Sponsorship Formation Event on May 3, 2012 at the Radisson, Bismarck. Leaders from the sister's sponsored ministries; the University of Mary, St. Alexius Medical Center, Garrison Memorial Hospital/Turtle Lake, came together for an inspiring day of collaboration on the mission and values that make these institutions great. It was a blessing to listen to Michael Naughton, Ph.D., Moss Endowed Chair in Catholic Social Thought and Director of the John A. Ryan Institute for Catholic Social Thought at the University of St. Thomas. Thank you to all who participated in this event and blessings to you as you carry forth the mission of Jesus. We keep you in our prayers!